Prof.mr. C.J.J.M. (Carel) Stolker kicks off his impressive volume, Rethinking the Law School, with a survey of law schools on all continents and an analysis and suggested models of legal education globally according to who controls legal education, i.e. as ‘strict state control’, ‘control by legal professions’, ‘control by the market’, and law schools themselves as gatekeepers. 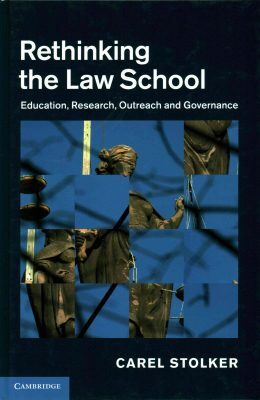 Chapter 2 looks at universities and their strategic challenges and Chapter 3 the law school in search of identity. Chapter 4 addresses how we go about educating law students as a distinct discipline while Chapter 5 continues this theme with a focus on pedagogical methods in legal education. With Chapter 6 he moves into legal scholarship, ‘venerable and vulnerable’. All of this is closely related with where and how legal academics publish and research, and Prof Stolker continues this topic into Chapter 7, ‘lawyers’ ways of publishing’, asking what is the role of legal scholarship? – Is it a science, or if not, how is it different? Next under the lens are law as an academic discipline and questions of methodology. He questions the reading materials used for legal education in an international context and urges us to consider the social and economic impact of the activities carried on in the schools and the missions of legal education and research, as well as social impact more broadly. Chapter 8 delves further into law schools’ economic and societal impact. Chapter 9 asks, ‘whose law school is it?’ The universities’? Academics’? Students’ and parents’ as consumers? Higher degree researchers’? Alumni and benefactors’? Or does it belong to no one, if we see the university as a public good? Chapter 10 takes on the interesting concept of ‘creating creativity’ in the law school and concludes with the ‘success factors’ crucial to a researcher: ‘energy, hard work, perseverance, drive and total commitment to your subject.’ Chapter 11 considers governance of law schools: strategy, leadership and collegiality. Chapter 12 moves us towards a common agenda and offers some conclusions about governance, research, and teaching. Prof Stolker not only brings his extensive experience to this work, but also demonstrates how deeply he considers and cares about these issues; it is clear that he brings his heart as well as his head to this analysis of legal education, to problems such as rankings (and the need to spend more time reading), the importance of collegiality and even of good food, the role of the university, the nature of the law as an academic discipline and an international discipline, and the interaction of law with other disciplines. Stolker is prepared to ask what is the role, what are our values, mission and vision in legal education? Overall the tone of the book is more practical than theoretical: what is the role of a dean? are we about vocational training? is legal education academic or professional and in either case what should be the content and process? He is similarly thoughtful as he queries pedagogical method, learning styles, use of textbooks, open source materials and assessment. Prof Stolker undertook this entire project in one year; he dedicates the book to his brother, who died in 1997. All royalties from the book go to the International Scholars at Risk Network.